I heard Christine Caine say this when she spoke at the IF Gathering a few months ago. It hit a nerve then, but if you've heard her speak, you know she says so much in such a short time that it literally takes weeks or months to digest and process it all. She posted this quote last week on Instagram and I was so thankful for the reminder. To get this bit of Biblical wisdom in basically a frozen sound bite. Because as I've thought about it, if you believe that this is true then it can radically change your perspective on the broken pieces in your life. Brokenness is not generally considered to be a positive or good quality in our culture. In our way of thinking, you don't want things to break. When you're a child, you certainly don't want to break Mom's expensive vase or favorite china. When you're a teenager, you don't want your first love to break your heart. You don't want new cars or appliances or gifts to break. Perfect and whole and shiny is all quite preferable to broken, which we equate to being unusable. Once something breaks, you toss it. Throw it in a garage sale. Donate it to a cause. It has outlived it's usefulness and must therefore be discarded. How we tend to treat relationships and people in the same vein. But the truth is that the Bible clearly illustrates, time and again, how very useful and powerful the state of being broken can become. 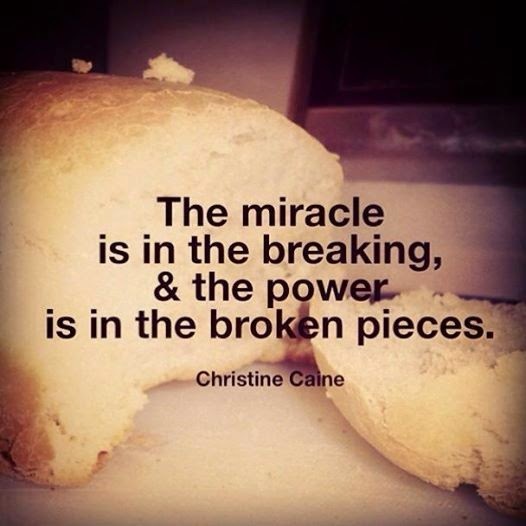 As Christine Caine stated it, the miracle is in the breaking and the power is in the broken pieces. How fitting to consider this during the Holy Week between Palm Sunday and Easter. The most ultimate example of the miracle in the breaking. The power in the broken pieces. Because as Jesus' physical body was breaking, the miracle of our redemption was completed. As the separation from His Father broke his heart, leaving Him crying out about being forsaken, the power of God's forgiveness was being released upon each of us. While Jesus' body was broken and pierced for all that we have or will do wrong, the power over sin and death and judgment was realized. Do these words ring true for the status of your own life? Heart broken by grief. Or shame. Or despair. Or loneliness. The brokenness of a marriage or relationship or the mistakes you've made that eat at you, day after day. The broken pieces of dreams you once dared to dream, but that now only haunt you. The ripping and shattering and tearing of precious things in our lives. Sacred things. And it leaves scars and callouses and empty places where hope once flourished. I know several families who just this past week found their lives broken as they said good-bye to loved ones. It's a shattering that leaves you wondering how to makes sense of the pieces left scattered about the landscape of your heart and mind. I have a word for you. I want you to consider that where you feel hopeless and useless and powerless, God is actually quite powerful. This is not an ending. But, this is where God can create a beginning. Because the miracle is in the breaking and the power is in the broken pieces. In Exodus 32 and 33, the fickle Israelites made a golden calf to worship as an idol because Moses was taking too long up on the mountain. When he came down and saw it, he threw down the stone tablets and they were broken. So, where is the power in the temper tantrum of a national leader? The people's hearts were set straight. They were forced to deal with their idols. Moses met with God once again, and once again, God showed his power and his love and faithfulness as he gave the ten commandments. The broken tablets led to broken hearts that led to a God who poured out favor and promised Moses that His presence would go with them and He would give them rest. Brokenness that wiped away the wicked ways and brought fresh revelation of God's presence and glory. In Joshua 5 and 6, the descendents of those Israelites came to the wall of Jericho. The Promised Land lay just beyond it. God gave his marching orders, commanding His people to circumcise themselves again. To do the cutting away so that the new could come. And then, they marched. And obeyed what seemed to be anything but a sound military plan of action. And the impossible walls of Jericho came tumbling down. Broken. The power of the broken pieces meant that the people of God moved from deliverance to freedom. The Promised Land was theirs, and they ate of its fruit. Broken pieces that brought the people of God to a new place of freedom and favor. In John 12, Mary broke all rules and expectations and threw all sense of decorum to the curb when she shattered her jar of expensive perfume to pour out on Jesus' feet. The broken jar. The extravagant worship. A woman realizing the only thing that mattered. Who ignored the ridicule and social norms in order to surrender herself completely to her Lord. And in so doing, completing a task on the eternal calendar as she anointed Jesus' body for burial. Shattering at a great expense that was misunderstood by many, but pleasing unto the Lord. Bringing herself to an intimate and precious ministry to the Jesus who would save her. Being used for His glorious purpose, unbeknownst to her. Simply because she was willing for the breaking. Jesus, huddled in the upper room with his beloved disciples, sharing the Last Supper. Tearing the bread and saying, "Eat, this is my body, broken for you." Symbolizing his greatest surrendering, his broken body to heal us, redeem us, claim us, save us. Broken bread and a cup of wine celebrating a new covenant, a new sacrament. A new remembrance. A new standard--to be willing to sacrifice for the sake of others. To define greatness by service and incredible love and to redefine power by the broken pieces. The veil of the Most Holy Places, torn from top to bottom, as Jesus gave up His spirit. The separation of the people from the most intimate place of fellowship with the Father--demolished. No longer requiring a priest. The curtain between the Holy of Holies and the Most Holy Place, torn. The people no longer required to give regular animal sacrifices. The ultimate sacrifice and the most glorious miracle of brokenness changing the course of history for all of mankind. The earth shaking and rocks splitting and tombs breaking open. The earth groaning in the momentous occasion that moved us from Before Christ to Anno Domini--from before the cross to living in the year of our Lord. It's an incredible shift of thinking to see that the miracle is in the breaking and the power is in the broken pieces. To even contemplate for a moment that the broken pieces of your heart and life, the very breaking point that is your most painful place may, in fact, hold the greatest power and miracle that God can perform in you and through you. To claim that power, surrendering your broken pieces to a God whose specialty is putting them all back together for His glory. To realize that here, in this dark place of shattering, you will find the miracle of being held through your darkest moments. The faithful presence of a Savior who redeems our broken roads. Who does not waste a tear. The ministry of the Holy Spirit who is our great Counselor and comfort and who intercedes for us with groanings too deep for words. Or, if your life is feeling rather whole and complete and wonderful...what jars of expensive perfume is God asking you to be willing to shatter for His sake? To bring you to a place of abundant fulfillment through living out His plans? What impossible walls keep you from freedom? What needs to shatter to bring you closer to walking in complete surrender? Beautiful mosaics are created from the broken pieces. Beautiful God honoring lives are, too. When we choose to believe that the miracle can, indeed, be in the brokeness. And His power can be in the broken pieces.